A long-time reader sent me an interesting problem this past week. The goal is to end up with a text string like "MWF" for Monday, Wednesday, Friday. The problem is that the weekdays are input as yes/no abbreviations like "NYNYNYN" for "MWF". 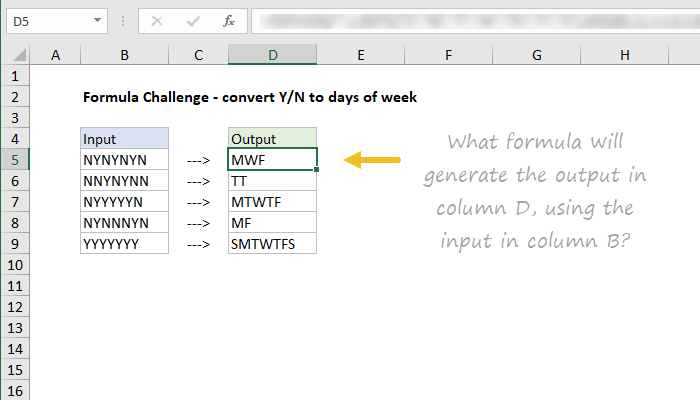 What formula will translate the "N" and "Y" to weekday abbreviations as shown in the screenshot above? The workbook is attached below. Post your answer in the comments. All inputs are 7 characters and contain only "Y" or "N"
Days are mapped Sunday through Saturday, SMTWTFS. This would be a typical solution, and nicely illustrates how concatenation works. Note: you are free to use line breaks inside the formula bar to make formulas easier to read. This solution uses array constants to simply the formula considerably. Note: Jon Wittwer posted a more sophisticated version of this formula in the comments below, spinning up the array constant using ROW and INDIRECT. A *slightly* more compact version using REPT, taking advantage of the fact that MID will return TRUE or FALSE for each value, and TRUE will evaluate to 1 or zero inside REPT.